In this series of posts I shall share some tips on preparing your own meals. Knowing how to cook some simple dishes will come in handy when you leave home and stay on your own. Firstly, it's very much cheaper. For those studying away from home and on a budget, you should learn up cooking. Secondly, when you get bored with the outside food, its a welcome change. Sometimes it may be troublesome to go looking for food especially during weekends when you don't feel like going out. Besides, it's healthier and and gives you a sense of achievement, too. 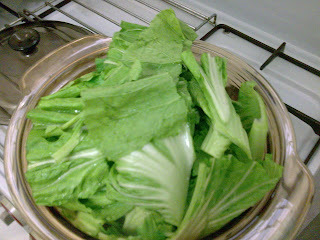 For the main vegetables, we use Kai Choy. If you can't find these vegetables you can improvise with other vegetables. The first step is to add a small amount of water into a pot, turn on the heat and add the ingredients one type at a time. I usually put in the roast pork first because it doesn't need any preparation. You'll need to add a cube of ikan bilis, other wise your chai boey won't taste nice. The original chaiboey has a lot of leftover tasty dishes so if you make it from scratch, you will need some tasty stock. You can add the serai, tamarind slices and dried chillies also because you only need to wash them and add them in. 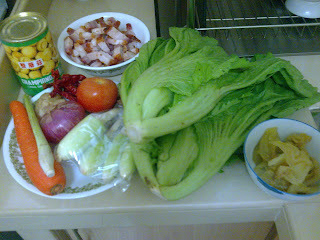 As the pot gets heated up, I'll prepare the other ingredients and add them in . Remember that you only need a small amount of water. Don't be tempted to start with too much water because the whole pot will overflow by the time you add everything. And the dish is not suppose to be a soup. As a guide, about 2 to 3 cm depth of water should be enough. 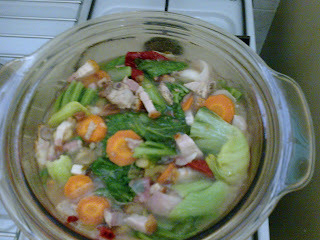 By the time you add the jagung shoots, mushroom, carrots, tomatoes and onions, your pot should look like this. Note that the water barely covers the bottom layer. 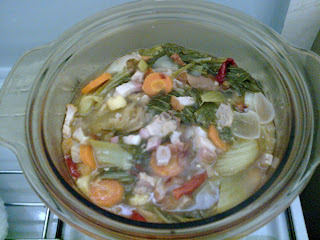 Later when the vegetables are cooked, the amount of water will increase. While this is cooking, you can wash and clean your vegetables thoroughly. Cut the stem into medium size pieces and add them in first. Then add in the leafy part. Don't be alarmed if you see your pot filled to the brim. It will all shrink when it is cooked. You won't see any water, but don't add anymore. It should look like this. Cover the pot and let it cook a while. 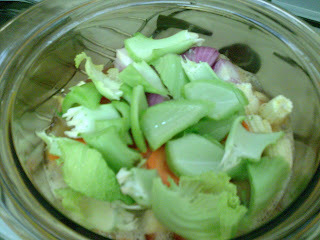 The vegetables will soften and shrink and the amount of water will increase. 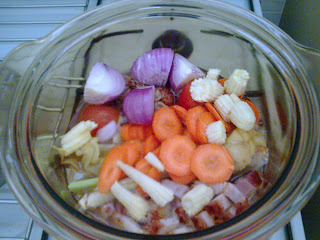 Mix in the vegetables and let it simmer for an hour. Check the taste and add any flavouring according to your taste. Usually I don't need to add any salt or sugar. The salted vegetables, ikan bilis cube, onions, carrots and roast pork, chilli and tamarind slices would have combined to give a very nice taste. By now your chai boey should look like this. The large pot of chai boey will be enough for a few people to share. Penang people can eat this alone with white rice without any other dishes. It is tasty, appetising, and quite a balanced meal, too. If you cannot finish it, keep it in the freezer or fridge and eat it later , maybe with other dishes like simple fried egg or omelettes.